Get affordable firearms legal protection rates and apply online for instant coverage, no need for an agent. Get lifesaving guides & checklists, a CCW reciprocity map, and weekly updates on news and changing laws. Explore an online video library, receive weekly training drills, or train in person with a Certified Instructor. Receive your Carry Confidence Kit and huge discounts on training, gear, and Spouse Membership. We’re a licensed insurance agency, so we get paid either commission or advertising fees by insurance companies or marketing partners for each referral or sale. Get instant ccw legal protection online with immediate coverage. Your personal information isn't needed to get membership rates. No need to deal with an agent or get hundreds of calls everything is online. So, What Is Concealed Carry Legal Protection? As we like to say, "In Plain English," ccw legal protection is simply protection against a self defense action for armed and responsible citizens. It will cover things like attorney fees and bond for both civil or criminal cases. How Does Firearm Legal Protection Work? If you are in a situation where you have to use force in self defense, this coverage will activate. Your amount of benefits will vary by provider and usually depend on the level of protection you purchased. You will find that unlike the best concealed carry insurance, legal protection plans actually will give you up front protection. This is why we recommend a ccw protection plan over self defense insurance. You get more than just access to a network of on-call lawyers who specialize in self-defense or firearms litigation. 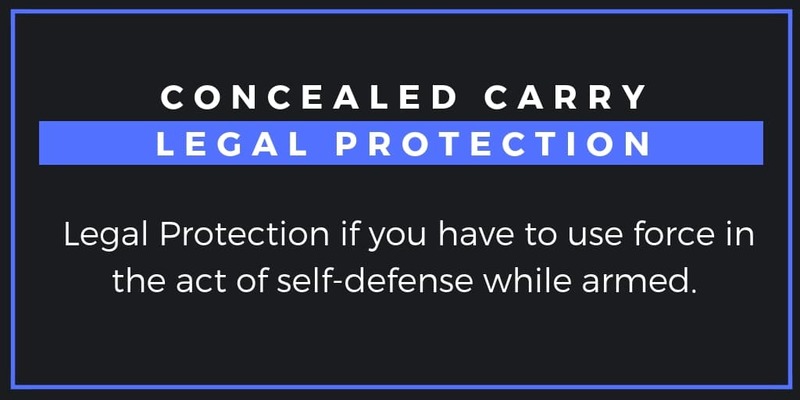 Unlike concealed carry insurance, a legal protection plan provides you, as a responsible American, with the education, training and legal protection you need to carry with confidence. The best thing about our Self Defense Legal Protection plans is that you’re instantly protected the moment that you activate your membership. The biggest myth surrounding self defense coverage is that you can't be sued if you use your concealed carry weapon in self-defense. However, even if no criminal charges are filed, the aggressor or their family can try to seek damages in a civil court. There are several situations where people have not been charged criminally for self defense but lost a civil case in court . This means they had to pay damages to the same people or person that either attacked them or was the aggressor. Can I get Personal Legal Protection online? If you are looking to shop for ccw legal protection online, then you have come to right place. We have made it easy to join the membership program online with a simple application process. Our partners make getting covered online incredibly easy and affordable with benefits starting instantly. You won't find another product and company that will make your legal protection a priority. You don't need concealed carry insurance to protect your family. Don't be shy, join the membership plan today and start protecting your family's financial future now. DON’T WAIT! PROTECT YOUR FUTURE & JOIN TODAY!